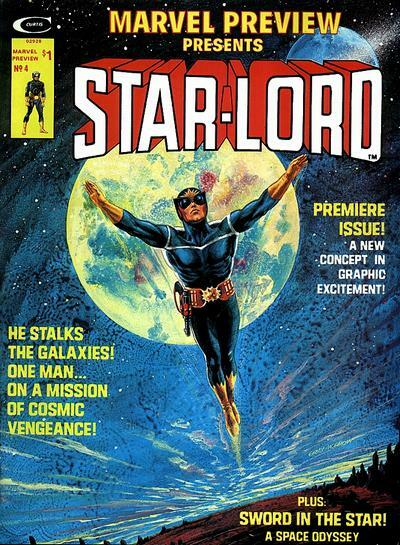 On January 10th, 1976, the world got its first glimpse at Star-Lord with the release of Marvel Preview #4. This issue featured two stories: “Starlord First House: Earth!” and “The Sword in the Star! : Stave 1: Alas, the Seeds of Man!” (whew, what a mouthful). Of course, the former was the story that featured Star-Lord. It was written by Steve Englehart, and illustrated by Steve Gan and Bob McLeod. Unfortunately, an official synopsis is not available from Marvel, nor is the comic available to download (shucks), but the Star-Lord’s origin is pretty much the same as it was in the issue of Guardians of the Galaxy #0.1 which was published not too long ago. How cool is that costume, though? Not terribly different from the uniform he wears for most of his career, though I like the pulpiness of this one, with the ray gun tucked into his belt holster.